2014 is rapidly approaching and if you are like my husband and I, we are searching through the house to find things to donate. 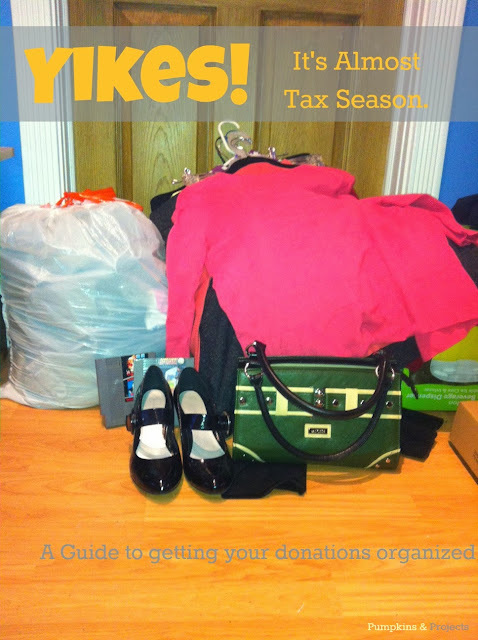 It is the annual end of the year tax deduction scramble to figure out what we can get rid of. And if you are like us, we have old, out of date lap tops laying around that you aren't quite sure what to do with. Well Goodwill now offers recycling service for your computers. They have partnered with Dell in a program called Reconnect to refurbish computers. What a better way to get rid of old computers collecting dust AND get a tax deduction out of it!! Sounds like a win-win situation. Just be sure to wipe the hard drive for security measures. When donating be sure to keep an itemized list of things being donated. I ALWAYS forget to write things down. Usually two weeks after I turn the list into the accountant, I remember a big ticket item we donated. I always walk away going "oh man, I forgot to list the VCR on the list." Not sure VCRs are considered "big ticket" items any more, but they have to be worth something. To prevent forgetting, I made myself a handy dandy sheet to record my donations as I am putting them in the bag. 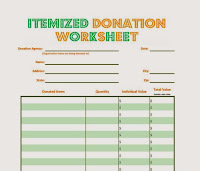 Get your copy of the itemized donation worksheet here. The Salvation Army offers a very nice donation value guide because I am never sure of the value. This gives a standard guideline of values, which is super handy and takes the pressure of figuring out how much a shirt you no longer wear is worth. When cleaning the closet for clothes that I can donate, I keep the list and make categories like Men's Dress Shirt, Women's Dress Pants, Women's T-Shirt, Women's Shoes, etc. Then as I load the items into the bag I put a hash mark in the quantity column, look at the donation value guide, and calculate out my total value. Once I get everything loaded into the car and drop it off at the donation center, I take my itemized list with me. Usually when dropping the items off the person at the donation center will ask for a value. I show them the list, and they will give me a receipt. I then staple the receipt to my itemized donation worksheet so I don't lose it. Armed with my itemized list and receipt I am ready for the accountant, or Turbo Tax if you are a do-it-yourself type person (I'm not brave enough for do-it-yourself taxes). Now, if you don't have anything to donate or aren't keen on giving away clothes you can also donate to the food pantry. I think this is a good time of the year to go through my cabinets and figure out what I'm not going to use. We have a lot of holiday gatherings at our house and things are always left here. We have a tendency to over buy because "too much is better than running out". Which means we buy enough ingredients for a double batch but only make one batch. Then I am left with ingredients to make desserts such as orange fluff. Super good, but after the holidays I am not motivated to make any sweets from the overload of holiday goodies. I like to gather all these extra tempting ingredient boxes and donate them to the local food pantry. So, good luck in the end of the year donation scramble and maybe I will see you at the donation center. Today we braved the cold and went out and got our Christmas tree. My husband's family has a tradition of going to a local cut your own tree farm, so we are continuing the tradition with Ella. It is nice to help support a local family and create a tradition with our little one. We decided to go alllllllllllllllllll out for the adventure. This afternoon we were the stereotypical overdo it type family because not only did we take the baby, the camera, and .......the dog! Poor Jason had to pull the cart to carry the tree, the saw to cut the tree down, and had to take the dog on the leash. My hands were full carrying the camera, holding Ella and trying to keep her boots on. They were quite stylish boots with the sequins, but they are a little big yet so they kept falling off. Before our adventure of picking a tree, I read the post from PBS's web site, How to Pick the Perfect Christmas Tree. The article was quite informative and gave good tips on picking a tree. First before you head out, be sure to measure your ceiling to figure out how tall of a tree you can fit in the house. We have 8 foot ceilings in our living room so we had to go for a 7 foot tree to leave room for the tree stand and star on top of the tree. The tree farm we went to had a measuring stick at the check out and would trim the bottom of the tree for you if the size needed to be adjusted, so we were set with the height of the tree. To ensure you have a fresh tree purchase it from a farm that lets you cut your own. Most trees are cut several weeks before they are delivered to the lots to sell. By cutting it fresh, the needles will last longer. Before choosing the tree to take home, pull on the individual branches if the needles fall off easily, the tree is probably not going to last the whole season. If the needles are falling off before it's cut, they will really fall off after it is cut! Be sure to pull the branches apart and inspect the trunk of the tree. Try to find a straight trunk otherwise it will be difficult to balance on the tree stand. After we cut our tree, the tree lot trimmed the bottom of the trunk so we would be able to easily utilize a tree stand. They then measured it to make sure it would fit in our living room, shook it to get all the dead needles and debris out of it and balled it for easy transport. We were then off to go home and set up our tree. When you first get your tree home remember to let it sit for 24 hours in the house before decorating so the branches can drop. Otherwise if you decorate your tree right away, everything will fall off in the night when the branches drop when adjusting to the warm house. 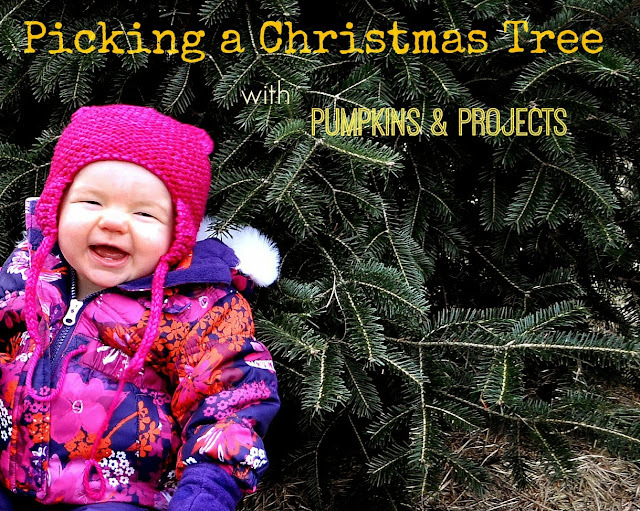 So now we are on to decorate a tree and try to keep an 11 month old away from the decorations. This is going to be a fun Christmas!